Did the Apostles tell cunningly devised fables in order to lie about Jesus' resurrection? 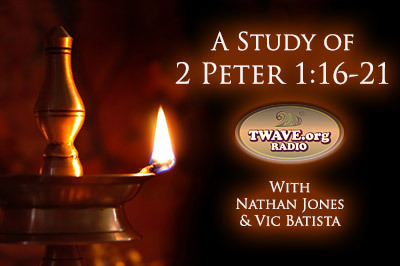 Vic Batista: Bible prophecy functions as a light in the darkness, according to 2 Peter 1:19. The verse reads, "And so we have the prophetic word confirmed, which you do well to heed as a light that shines in a dark place, until the day dawns and the morning star rises in your hearts." Even though Bible prophecy is so important to our Christian walk, there are so many preachers who are refraining from teaching God's prophetic word. Yes, sadly, many leaders and pastors do not think that 31% of the Bible is important. Nathan Jones: Lamb & Lion Ministry's television program Christ in Prophecy has gone on the road to take interviews. We went to the Pre-Trib Conference, which is a major Bible prophecy conference held in Dallas every December and hosted by Dr. Tim LaHaye. During that conference we interviewed different professors and Bible teachers and TV personalities to get their take on what they thought about various subjects related to Bible prophecy. One of questions asked of these learned men was, "Why do you think Bible prophecy is important today?" They told us why. The reason many thought the study of Bible prophecy is important is because 31% of the Bible is prophetic in nature. In other words, God has dedicated almost a third of the Bible to revealing what the future has in store for mankind. What's revealed by Bible prophecy is pretty much all good news for the Christian. Jesus Christ is returning. He is going to set up His Kingdom of peace, righteousness and justice. Evil will be defeated. Christians will rule and reign with Christ as His heirs. Jesus will call us not servants, but heirs. Christians have a fantastic future in store for us! Pastors and Bible teachers should also want people to have that hope. We can receive so much hope from knowing that God's children have a bright future ahead. Vic Batista: I think we need to recognize that often times the picture some Bible prophecy teachers portray is not always accurate. Their false predictions have turned many Christians away from the study of Eschatology and has left a bad taste in their mouth over the subject. That's why we all need to always go to God's Word to find out exactly what God really has to say about an important prophetic matter and how it relates to us today. The Apostle Peter does an incredible job in 2 Peter 1 of doing just that. "For we did not follow cunningly devised fables when we made known to you the power and coming of our Lord Jesus Christ, but were eyewitnesses of His majesty. For He received from God the Father honor and glory when such a voice came to Him from the Excellent Glory: 'This is My beloved Son, in whom I am well pleased.' And we heard this voice which came from heaven when we were with Him on the holy mountain." Vic Batista: Amazing that Peter is writing this incredible passage regarding Bible prophecy. I love verse 16 which says how the Apostles did not follow "cunningly devised fables." Nathan Jones: The Gospel message that the Apostles were spreading around the Mediterranean Sea to the regions of the Roman Empire was to people who had never heard anything about Jesus or Yahweh God. These people had been raised with Greek and Roman myths. They believed in superhero type characters such as Zeus and Athena, and all those other myriads of gods and goddesses. Then, all of the sudden, the Apostles show up sharing this Good News of Jesus Christ and the people are like, "Say, what? What in the known world are you talking about?" Peter's response was to say that the Apostles were not sharing with them fake stories. They were not making this Jesus and the miracles He performed up. The reason the Apostles claimed was because they were first-hand witnesses to Jesus' ministry. They were there from the beginning. They saw everything from the beginning to the end of Jesus' 3.5 year ministry. After Jesus ascended to Heaven, the Apostles then went out into the world and shared that which we now call the Good News. Vic Batista: The Pharisees started rumors back in the days after Jesus had resurrected to counter the Apostles' claims, right? Nathan Jones: There was indeed a cover-up after Jesus resurrected from the dead, came out of the tomb, and walked right past a bunch of powerful, Roman guards. According to Matthew 28, the Chief Priests paid the guards to claim that they were asleep while Jesus' disciples came and stole the body. Now what Roman guard is going to go around telling everybody that they slept while on duty? That would be the end of their lives as punishment. The Romans killed their guards for falling asleep on duty. The priests bribed them well because the Romans did indeed go out and told everybody they had fallen asleep. It sounded more sane than they were terrified by angels! Can you believe that the Apostles would be lucky enough to find a Roman troop all fast asleep on duty, sneak by them without causing a stir, noisily push a giant stone out of the way of the tomb, and then take Jesus' body out of the tomb unnoticed? All this was done supposedly in order to create a legend that Jesus rose from the dead. What absolute nonsense! That nonsensical story is definitely one of the fables that the Enemy has used in an attempt to try and drown the real truth of the message of Jesus Christ and His life story. Vic Batista: That is why we call them fables. Anyone who doesn't research the total improbability of such a story is rather gullible. Think about the weight of the stone that was rolled to cover the mouth of Jesus' tomb. It'd take many men heaving and ho-ing to move that rock. Nathan Jones: It took quite a lot of men to push that rock over, not doubt. I've seen modern-day estimates of it's weight. We are talking about 1-2 tons! You would need a whole troop of Roman soldiers in order to push that stone in front of the opening and seal the tomb off. To think the priests tried to pass off this fable that the Apostles showed up while the Romans were sleeping and grunting and groaning rolled that stone away from the tomb, snuck into the opening, took a body out, and then slinked away all while the Roman slept? That is absolute nonsense! And yet, to this day there are people who have rejected the Bible and will believe in such a lie. In the second segment of our study of 2 Peter 1:16-21, we'll look at those who provided first-hand eyewitness accounts of the resurrected Christ. Isn't it sad how those in power use lies for their own gain? Still true today. How did they explain that over 500 people saw Him after His Resurrection? He walked among them for 40 days. Even "Doubting Thomas" was convinced. My guess is that the "partial blindness" was already in place. Great study. Looking forward to the next excerpt. Good questions, Denise! I've always wondered how the priests passed off the rent veil. I imagine they blamed the earthquake. Denise said "How did they explain that over 500 people saw Him after His Resurrection? He walked among them for 40 days. Even "Doubting Thomas" was convinced." Revelation 9:20-21 "The rest of mankind that were not killed by these plagues still did not repent of the work of their hands; they did not stop worshiping demons, and idols of gold, silver, bronze, stone and wood--idols that cannot see or hear or walk. Nor did they repent of their murders, their magic arts, their sexual immorality or their thefts." These people will know what is going on but they hate God and no matter what they will not turn to him. They love things of the flesh and their own will so much that they choose to suffer and die rather than turn to the Lord. Revelation 19:14 "The armies of heaven were following (Jesus), riding on white horses and dressed in linen, white and clean." Revelation 19:19 "Then I saw the beast and the kings of the Earth and their armies gathered together to make war against the rider on the horse and His army." Those who reject Christ in the past, the present and the future are all made of the same evil...they love themselves and their desires above all, even our Lord Jesus who offers Himself to save their souls. Very tragic. Excellently stated and very insightful, Billy! Evil people will always hate God, even when they have overwhelming evidence that God exists and Jesus is the Savior.